Kildare made the most of their blistering start to cruise by Carlow at a wet and windy Newbridge this afternoon and pick up a second round win in the O’Byrne Cup. On a day which saw three other matches in the competition postponed due to weather inclement, Cian O’Neill’s side kicked the first eight points to take total control of this contest in the run up to the interval and went in leading by 0-11 to 0-2 after Daniel St Ledger's free in the 25th minute had finally broke the trailers' duck. Neil Flynn made it a 10-point game early in the restart before Carlow pulled back a sorely needed goal through Darren Lunney, who had latched on to a sideline ball from Brendan Murphy after fired home for all three points. That was as good as it got for the Barrowsiders though as Flynn (2 frees), Tommy Moolick and Conor Hartley brought the winning tally up to 0-16 for the hosts in spite of the difficult conditions. McCormack (2), Flynn (3, 2 frees), Eoghan O’Flaherty and ex-U20 star Jimmy Hyland (2 frees) had landed the first eight scores for the Lilywhites inside the opening 23 minutes and, despite Lunney’s goal, they had killed off the game prior to the final quarter to ensure an opening win after having received a bye last weekend. Next up for Kildare is a visit to Offaly on Thursday night while Turlough O'Brien's men face the same opposition on January 5th in search of their first win of the new season. 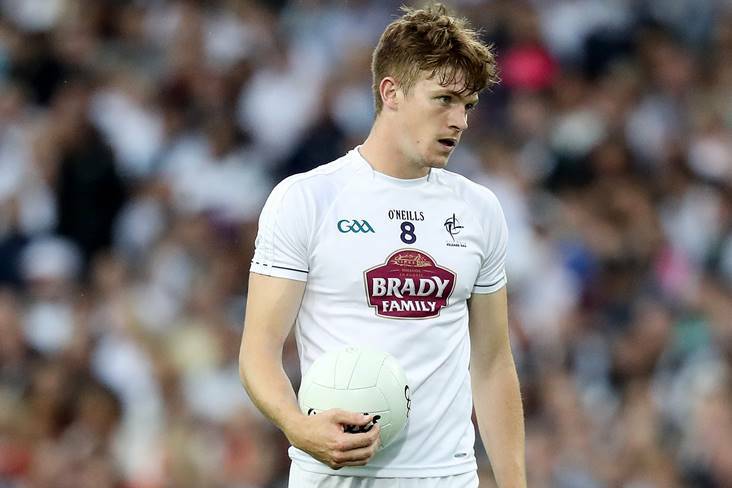 Kildare - M Donnellan; M Dempsey, M Barrett, M Hyland; C O’Donoghue, E Doyle, K Cribbin; K Feely (0-1), P Cribbin; D Slattery, E O’Flaherty (0-2), C Hartley (0-1); J Hyland (0-3f), B McCormack (0-2), N Flynn (0-6, 5f). Subs: T Moolick (0-1) for K Feely, P Fogarty for B McCormack, P Nash for E O’Flaherty, B McLoughlin for J Hyland, J Gibbons for D Slattery, DJ Earley for C O’Donoghue, J O’Toole for M Dempsey, A Tyrrell for C Hartley, D Malone for M Hyland. Carlow - C Kearney; J Murphy, S Redmond, C Lawlor; K Nolan, S Doyle, D Lunney (1-0); D Moran, Chris Crowley; C Doyle, D Foley (0-3f), L Walker; Conor Crowley, B Murphy (0-2), D St Ledger (0-1f). Subs: R Kane for Conor Crowley, J Moore for K Nolan, E McGrath for S Doyle, N Lowry for Chris Crowley, J Kennedy for C Lawlor.